*background* As I found a new love for m/m historical romance, I wanted more and more people to give it a chance. 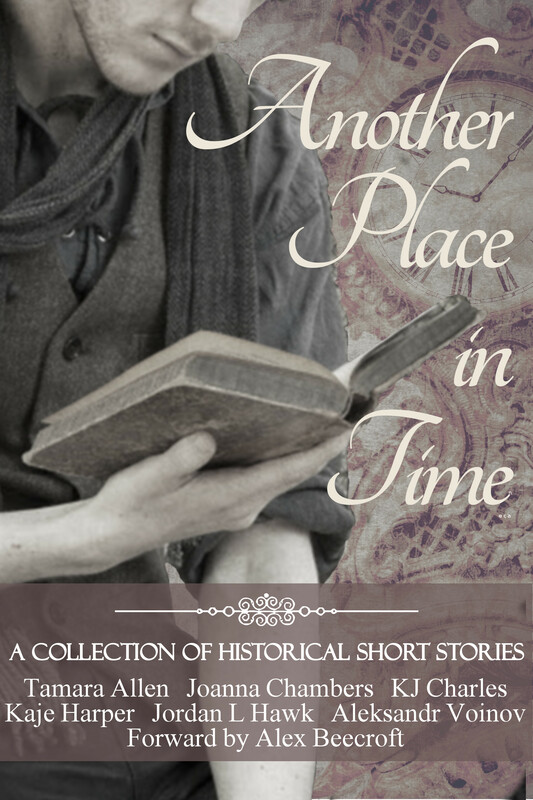 So, I called upon some of my FAVORITE authors…a veritable all-star team…to write their own historical short stories that I could put together in my “dream” anthology. The result: “Another Place in Time” (reveiwed HERE by Sara). This anthology features works by Tamara Allen, Joanna Chambers, KJ Charles, Kaje Harper, Jordan L. Hawk, and Aleksandr Voinov, along with a powerful foreword by Alex Beecroft. All proceeds donated to AllOut.org. Available at AMAZON, SMASHWORDS, B&N, KOBO, and ARe. If you could put together an anthology of your THREE favorite authors, writing stories in one category/genre, which authors and what genre? I would want a dystopian science fiction anthology written by Ginn Hale, SA McAuley and Manna Francis. All the stories would take place in the same world with some character crossover just like Irregulars. Theme: Circus/Slight Fantasy/Steampunk where the magic and wonder of circus life combines with romance… Must have that magical like not exactly this world kind of situation. I am going to go with different set authors who are my favorites but have not been mentioned a lot by me during these QotW sessions: Cornelia Grey, Anyta Sunday, and Kim Fielding. Dystopian set enemies to lovers theme. By Manna Francis, S.A. McAuley and Jordan Castillo Price. I’d like to see what Manna Francis, Aleksandr Voinov and Dani Alexander would do with paranormal. Oooo, I would gorge myself on a trio of Heidi Cullinan, Jaime Reese and Marie Sexton. Wait! Can I top it off with LA Witt please? And I would take ANY genre. I can’t be greedy and picky. Well, as mentioned above, I kinda already got to build my dream anthology! BUT…if I could do it all over again, I’d do a “Broken Characters/Anti-Heroes” bundle by Jordan Castillo Price, Santino Hassell, and KA Mitchell. I’m really into the mafia/gangster theme. I would love an anthology written by Aleksandr Voinov, Avril Ashton, Rachel Haimowitz and Rhys Ford. And the darker and more taboo, the better. Oh how about cyberpunk science fiction? Aleksandr Voinov, LA Witt, Jordan Castillo Price, and Rachel Haimowitz. Put in my vote for more Irregulars, too, please. I just recently read it for the first time. Amazing anthology. Ami, I’ve had a circus plot bunny in my idea file for some time now. And I certainly loved Anyta’s Love’s Landscapes story. The story’s a definite possibility! It’s an idea I really like. But I have so many plot bunnies…. I want to see Mary Calmes, Amy Lane and Cardeno C all write something together. I’ve seen them write with others and in collabing in a two person team but not all three together. This entry was posted on October 10, 2014 by BioB in News and tagged anthology, question.